These may be the easiest of easy-to-care-for houseplants because they grow even if conditions are no where close to optimal or if they are somewhat neglected. Some people claim they can’t be killed, and for that reason their nicknames include “Snake Plant” and “Mother-in-Law’s Tongue” (apologies to Payne’s Tropical Greenhouse Manager, Gaiby, who really dislikes that name). 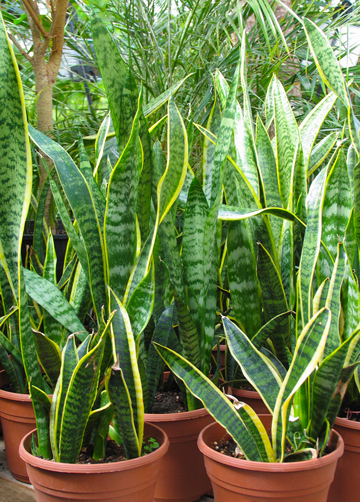 While sansevieria can handle some direct sun, they prefer bright indirect light — facing a north-, east- or west-facing window is best because a hot southern exposure to northern New Mexico’s extremely bright sunlight can burn them. They can tolerate in darker conditions but will grow even slower than usual. They prefer temperatures between 60° and 80° but they can survive both hotter and cooler conditions on a limited basis. Water weekly from spring through fall and cut back a bit in winter months — over watering can cause the roots to rot. Keep in mind they grow slowly, regardless of light conditions, and love to be pot-bound. Feed every few months with 20-20-20 general purpose fertilizer diluted to half strength.